Start by removing all of the food and items from your pantry. Survey the space to see exactly how to best organize the area, then grab some cleaning supplies and start scrubbing! Thoroughly clean your pantry. Wipe down all shelves with a wet cloth, then dry them completely. Don’t forget to vacuum and dust those hard-to-reach corners where mold likes to grow. 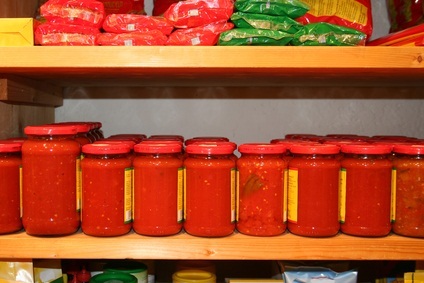 Categorize items and group like goods together on your pantry shelves. Discard any opened, dented or sticky cans of food because this could be a sign of insects, rodents or mold. If while re-organizing your kitchen pantry you see heavy mold growth or notice any water spots, immediately give our water damage restoration specialists a call because you may have a pipe burst or plumbing leak behind the pantry walls.